Bear Hunt: It’s true. Floridians cannot be trusted to hunt bears. If you go back and look at the multitude of blogs I have written about the bear hunt you’ll see I was right. Unfortunately being right doesn’t bring back the lactating bears. Does not give young cubs their moms back. Florida’s first bear hunt in 21 years may become a victim of its own success. Florida’s hunters have killed so many bears that state wildlife officials say they are likely to end what was envisioned as a week-long season after only two days. The commission had set quotas for each of four areas where hunting was allowed, and Wiley shut down two of them at the end of the first day of the hunt because they exceeded their limit of dead bears. The hunters in one of those regions, the eastern Panhandle, had brought in twice as many dead bears as the limit permitted. Updated figures presented in the 3 p.m. conference call showed the hunters killed even more bears than the official record reflected on Saturday. In the eastern Panhandle, the new numbers show hunters killed 112 bears, or nearly three times the limit of 40 that the commission had set. The Central Florida region’s limit had been 100, and hunters topped that too, bringing in 139 dead bears by mid-day Sunday. Both of those sections were closed to hunting as of 9 p.m. Saturday, but commission rules say hunters had up to 12 hours to bring in any bears killed before the area was closed. That’s why the numbers were much higher as of Sunday. The commission’s top bear expert, Thomas Eason, said the high number of bears killed showed that hundreds of eager hunters spent weeks scouting locations to guarantee a shot at a bear. He also credited the high number of bears killed to the fact that the last Florida bear hunt was in 1994. “The bears haven’t been hunted in 21 years, so they’re relatively naive,” Eason said. Opponents of the hunt, including the Sierra Club and Speak Up Wekiva, called for the statewide hunt to be shut down Saturday, warning that killing too many bears would be a disaster for a population that until 2012 was on the state’s imperiled species list. But Wiley only closed the areas that had exceeded their quota. Decades. Sloppy. Hunter’s would it difficult to track. Science trumped sloppy guesswork. They honestly think that calling rick scott’s office and being angry voter is going to make a difference. He is probably dancing on the table. This is correct. Florida bought and Paid for. Mission Accomplished! Here is some video. its terrible. I’m warning you now. On this one they got most of the story wrong. Listen to his words. We are suppose to protect the bears. The hunt was picked on cherry picked data. Florida’s decision to reinstate bear hunting after a 21-year hiatus (link is external) ignores well-established science on human-bear conflicts and constitutes an appalling magnification of the ethical defects afflicting the killing of grizzly mother Blaze by officials at Yellowstone National Park and, more recently, the killing of Boulder Bear 317 by Colorado Parks and Wildlife. 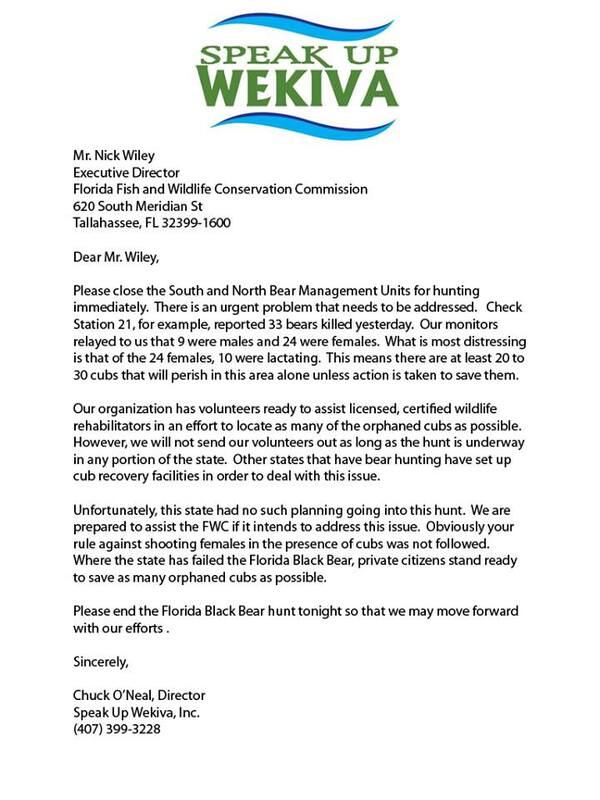 320 black bears – 10% of the estimated statewide population – have been targeted by Florida’s Fish and Wildlife Conservation Commission (FWC) for killing by recreational hunters (you can see the hunt plan here), a lethal response that is massively disproportionate to the concerns that have been articulated by human stakeholders about property damage and a handful of relatively minor attacks on humans. The hunt’s quota is in addition to the increasingly routine practice of killing bears who have been deemed a nuisance and to high road kill rates (282 in 2012 alone (link is external)). A combined mortality rate of 20% of the entire bear population has become Florida’s ghastly new definition of sustainability, while the human population of the state increases by more than the entire bear population every single week, a fact that human policy-makers regard as a source of pride (link is external), not a cause for grave concern. Instead, Dr. Eason, for one, seems to be perfectly comfortable with Floridians repeating their familiar role as super-predators, killing adult bears in their prime reproductive years, imposing far-reaching collateral damage on family units and the bear population as a whole. Although Florida’s bear hunt forbids the “harvesting” — read, killing — of mother bears with cubs, this will inevitably happen, since mothers commonly “tree” their cubs up to 200 yards away, out of sight from hunters. Black bear cubs stay with their mother for up to two years, learning essential survival skills and enjoying her protection from male bears and other animals who may harm them. As orphans, their prospects for survival are grim. And, since we know that animals experience a wide range of emotions, including joy, love, empathy, and grief, it is beyond dispute that these cubs will suffer immense emotional, as well as physical, distress. Equally repugnant is the fact that the FWC knows that some female bears will be pregnant at this time of year (just prior to denning), and there is no way for hunters to discern the gender of their target until they’re killed. Far from apologizing for these horrific effects, Dr. Eason has matter-of-factly stated that this is all part of the plan. please read this from our friend at the Daily Kumquat. and lastly from my friend Debbie Culp over on the west coast of Florida. We must must find a way to come together and talk. Because while we’re fighting over this who knows what is being plotted and planned. When controversy strikes, I strive to hear and understand the position and feelings of the perceived opposition. Tho very defensive at first, and rightfully so given the numerous arguments and personal attacks on individuals, generational families, and hunting culture at large, I found some very genuine hunters willing to speak openly and honestly about the hunt, existing law, and FWC. While they strongly defended their rights to traditional hunting, the need for FWC reform in policy making was expressed. They openly admitted that the FWC based their policy on the bear hunt on old data of bear population. They felt that had updated data been presented prior to the hunt that it would reflect even higher numbers of population based on what they had observed in certain locations. This of course is only speculative because FWC did not bother to do this when making such an important decision. They also suggested a need for reform in laws on fining the practices of unethical hunters with fines as low as 50 dollars for killing a Mother bear with cub under 70lbs. They also adamantly expressed the need for human population control in the state of Florida and openly expressed that much bear and other wildlife’s habitat has been consumed by development and particularly sited developments next to wetlands critical to the survival of wildlife. In defense of the attacks on trophy hunting, they explained that the traditional hunter does eat the meat. Although I do not prefer bear meat, I have been to plenty of wildlife dinners where bear was served. While this may be revolting so some, we have many families in Florida, many going back many generations in Florida living sustainant lives, where hunting, fishing, , raising their animals and growing their food is an integral part of their lives as they pass down traditions to their children. Thank you Debbie. Your opinion is very much appreciated. Thanks to all the monitors, documenters, Chuck O Neal and everyone that has spoken out to what we know in our hearts is a mess. A big bloody mess. I was very proud to read through the list of permits and find only one person in Martin County bought a permit. This was CBS national news who got most of the story wrong calling every against animal activists. Thank goodness they put in that bit about Ron Bergeron. CBS we are citizens of Florida and we have an opinion and we have a right not to be pigeon holed. I don’t see any where to leave comments. The Hunt is all over Florida. My issue as I have stated before is not hunting bears. There are bear hunts and other places seem to know how to do this. Florida does not and the agenda is driven by the Governor who is driven by his masters. We have seen this behavoir last winter at SFWMD and even lately when they tried to do the right thing and keep taxes the same.